A carrier is an individual that is heterozygous for an autosomal recessive condition, or a female that is heterozygous for an X-linked condition, that they themselves are unaffected by (and never will be). Carrier testing is usually performed on individuals with a family history of a disease. Additionally, certain ethnic groups are more likely to be carriers of certain deleterious alleles. For example, sickle cell anemia is much more prevalent in individuals of African descent. Additionally, 1 in 30 Caucasian Americans are symptomless but carry one copy of a gene mutation, that when present in two copies, causes cystic fibrosis (CF). The American College of Obstetricians and Gynecologists (ACOG) recommends that CF screening be made available to all couples considering starting a family. Hundreds of disease-causing genes can be detected by carrier screening. If only one parent is a carrier, then the couple need not worry about the health of their offspring. If both parents are carriers, they have a 25% chance of conceiving a baby with the recessive condition. Carrier screening is available for cystic fibrosis, sickle cell anemia, Tay Sachs disease, hemophilia, Canavan disease, and many more. Ideally, carrier screening is performed before pregnancy via a noninvasive blood test. However, if a woman is already pregnant, she and her partner can receive carrier screening, and the results can be used to determine if invasive testing of the fetus is warranted. While it is possible to receive carrier status information through some direct-to-consumer genetics companies, most individuals seek testing through a healthcare provider. This ensures that the results will be interpreted properly and appropriate decisions can be made. In some cases, one parent already knows they are (or will be) affected by a disease, or both parents are carriers of a disease-causing gene. In these instances many individuals will seek genetic testing to find out if their fetus will also be affected. Genetic testing of the fetus requires fetal DNA. At present, most techniques for retrieving fetal DNA are invasive and have an associated risk of miscarriage. Newer technology allows fragments of fetal DNA to be extracted from the maternal blood supply and then analyzed. However, this form of testing is not yet widely available for the detection of most diseases. 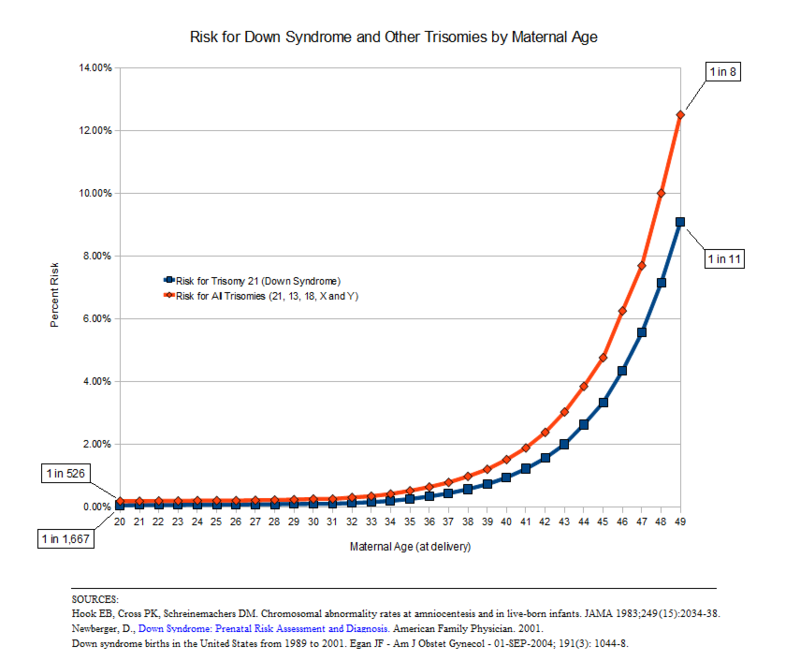 Another disease risk factor is maternal age. Women age 35 and older have greater risk of conceiving a child with an abnormal number of chromosomes (aneuploidy). The most common of these conditions is Down Syndrome (see figure below). However, not all women over the age of 35 will have invasive testing performed. Instead, a series of noninvasive tests like ultrasound and blood tests will give an indication of whether or not there is a problem. At that point, the parents can choose whether or not to pursue further testing. In the case that the child does have a genetic disease, prenatal testing allows for parents to become mentally and physically prepared, or decide to terminate the pregnancy.